(bottom row) Bill Jean, Jeff Luter, and Karol Carroll. 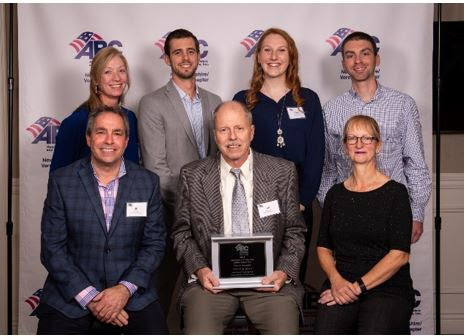 Amherst, NH Fulcrum Associates was awarded two Excellence in Construction awards from the New Hampshire and Vermont chapter of Associated Builders and Contractors, Inc. (ABC). 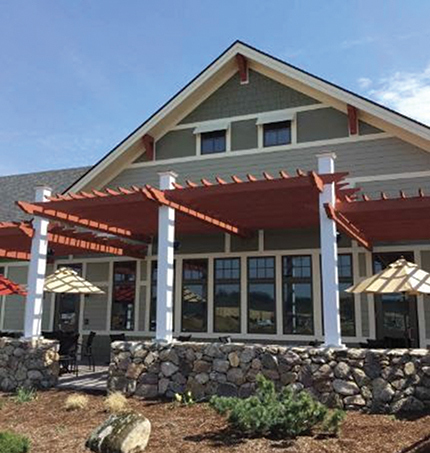 Fulcrum was recognized for renovations completed at the Northeast Delta Dental Stadium in Manchester and the construction of the second Copper Door Restaurant location in Salem. 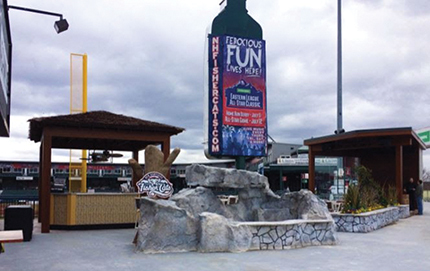 With the goal of creating exciting, unique experiences for new and returning fans alike, Fulcrum began work on structural and cosmetic improvements to the Northeast Delta Dental Stadium, home of the New Hampshire Fisher Cats Minor League baseball team. Beginning in January 2017, the project included the now-popular plaza area, which greets guests with an illuminated rock and waterfall structure, tiki bar, stage for live entertainment and high-top table seating. This area has become widely popular for pre-game entertainment, including family-friendly, live music before and after Fisher Cats games. Additionally, renovations were made to the Sam Adams Bar and Grill, which now offers a full buffet during select games, with tiered swivel-chair seating and drink rails added above left field. Structural improvements were made to the underside of the new seating area to replace the rows of picnic tables that formerly occupied the space, which allows for views of the field from every seat. “Knowing that the stadium already meant a great deal to the local community, we were honored to be part of a project that would benefit Manchester’s economy and the dedicated baseball fans of New Hampshire,” said Jeff Luter, president of Fulcrum. Overcoming winter weather that cut down on working days, the project was completed under budget and on time for the home opener in April 2017. ABC New Hampshire/Vermont awarded Fulcrum a Merit award in the Institutional/Public Under $2 million category for this project. Having constructed the original Copper Door in Bedford, Fulcrum was familiar with Great NH Restaurants’s vision of creating a space that blends a contemporary design with elements of a classic New Hampshire countryside. For the Salem location, a more efficient system was designed that includes structural insulated panels, low-flow water devises, high-efficiency HVAC, and electrical systems and controls that exceed EnergyStar standards. Construction was planned for completion before the fall holiday boom which required extreme attention to coordination around mechanical, electrical, plumbing and fire protection. Fulcrum credits the following partners for playing a critical role in completing the project on time: Amore Electric, On-Line Plumbing and Heating, Aubin Woodworking, South County Post and Beam, Marchand Painting, Oliver Mechanical, and Jet Concrete. Through pre-planning and coordination between all trades, many elements were completed in tandem and the restaurant was able to open before Thanksgiving of 2017. ABC New Hampshire/Vermont awarded Fulcrum a Merit award in the Commercial $2-5 million category for this project.